Long dc or spike st.
Insert hook into dc on rows below, pull up long loop and work dc in normal way. Round 7 - ss to first 1ch space, 4ch, 1tr into same space, (1tr, 1ch, 1tr) into each 1ch space to end, ss to 3rd of 4ch on beginning of round. Fasten off. Round 9 - ss to first 1ch space then work as Round 8. Fasten off. Round 10 - Join colour 3 to first 1ch space, make 1ch, 1dc into base of 1ch, * make 4ch, 1dc into next 1ch space, * rpt from * to * to end, make 4ch, ss to first dc on beginning of round. 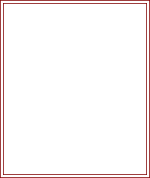 Round 13 - Join colour 2 to first tr, make 2ch, (1tr into next tr, 1dtr into each of next 2tr, 1tr into next tr, 1htr into next tr), * (1htr into next tr, 1tr into next tr, 1dtr into each of next 2tr, 1tr into next tr, 1htr into next tr) * rpt from * to * to end, ss to top of 2ch on beginning of round. Fasten off. Turn. Round 14 - Join colour 3 to first tr, 1ch, 1dc into base of 1ch, 1dc into each of next 5st, * 1 long dc into dc on Round 10, 1dc into each of next 6st, * rpt from * to * to end, 1 long dc into next dc on Round 10, ss to first dc. Fasten off. 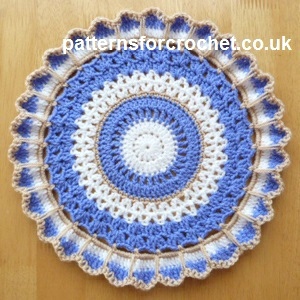 Hope you enjoy this free crochet pattern for a round doily.